The digital real estate landscape is dominated by big brands like Zillow, Trulia and Realtor.com. We have developed our dynamic real estate listing script with SEO-friendly architecture and coding style, without a well designed SEO-strategy followed by consistent execution, it’s very difficult for an individual real estate entrepreneur to start his business in this market. However, with that being said, the challenge is great, few realtors are willing to put the time and effort into doing the online real estate business right. We have created this opportunity for dedicated individuals looking to build a long-term asset with sustainable and consistent search traffic that leads to real leads and real business with the help of our API based real estate script. People seek the internet now-a-days more than ever, when it comes to looking for homes and finding real estate properties. In order to spare you the time, effort and money in finding the perfect script, we have developed our very own real estate auto listing script that will perfectly suit your business. Our script searches multiple real estate sites like eBay, Yakaz, Oodle, Realty Bargains, Craigslist, and more, all at once. 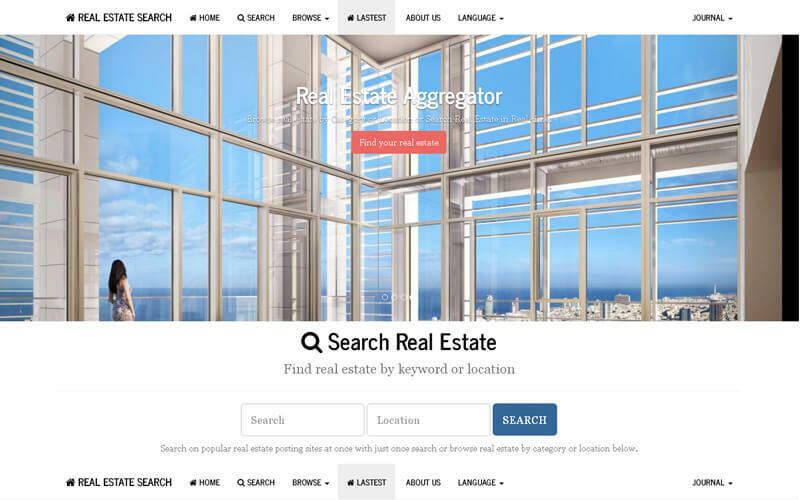 You can browse the Real-estate – search engine by location and category-wise which makes it easy for the visitors easy to find the right real estate. We provide you with multiple listings to search the real estate. This script can filter real estate by location, category and pricing so it is easy for people to find the real estate they are looking for without much effort. You don’t have to be a technically sound person or possess a database as our script fetches the real estate listing from other web portals and sites as soon as it is launched and live. Our scripts are created with user-friendly URL structure to favor SEO optimization and the pages are created with OpenGraph meta tags and htaccess enabling us to rewrite the URLs to make it SEO easy. Our Script has a responsive device that supports a variety of devices from mobiles, tablets to laptops. We can assure you that our script will definitely boost your business to meet all your needs as it is fully customizable by our expert designers and we have integrated with banner advertisements and AdSense with Google analytics ready to fetch you revenues apart from commissions. I am interested in real estate business but I don’t have the proper guidance. This script make me to start the real estate business to follow up my dreams. Really thank you so much for the team. Real Estate Script is useful for me to open a site in a market. Really awesome design and easy for the clients to use. On the whole it makes me satisfy. The script which changes my level to up and user-friendly design, interactive space and dynamic usage. Overall mind-blowing product.